Lately, with the advancements in science and technology, there has been a huge increase in the use of automatic garage door opener instead of manual one. But even now many people around the world have very little idea about a garage door opener. 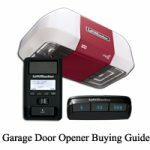 So before purchasing a one, we should understand What is a Garage Door Opener and why we need a garage door opener. A garage door opener is a device which is used to open and close garage doors electronically with the help of switches on the walls of a garage. It is available in a remote-controlled format also which opens the door from a short distance. The working mechanism of a garage opener is mainly driven by a power unit. The power unit has an electric motor which is attached to a track. A trolley is attached to the garage door via an arm which slides back and forth, thus opening and closing the garage door. When the motor is operating, the trolley pulls along a chain, screw or a belt. Suppose there is a power failure, in that case, the quick release mechanism will disconnect the garage door from the garage door opener. The entire mechanism of garage door opener is situated above the garage door. The power unit is located at the end of the garage and hangs from the ceiling. Chain drive openers: They have a bicycle chain which connects trolley to the motor. Jackshaft openers: They move the garage door up and down with the help of a motor that is attached to the side of a torsion rod which spins up and down. The main benefit of this type of garage opener is that it saves space from the ceiling but it needs a torsion rod installed with the door which is a drawback. Remote controlled garage door opener has been here with us for a long time. The first generation had a transmitter and a receiver which controlled the opener mechanism. The transmitter will transmit a radio frequency and receiver will listen to that radio signal, thus opening and closing the garage door. But due to low power and limited range, the transmitter signal would be received by the nearby opener also. In the latest technology, a rolling code is employed to solve this problem. In this, a different code is sent from the previous one, thereby unlocking the door. Transmitter sends the ‘next’ code in sequence .receiver compare ‘next’ code to its calculated ‘next’ code. Lately, there has been a rise in incidents of cloning of garage door openers. It has been due to the fact that most garage door openers use fixed–code encoding techniques. This can be cloned easily with a remote-controlled duplicator (copy remote). Why we need a Garage Door Opener? Automatic courtesy lights: They turn on and off when the garage door is opened and closed respectively. Remote lockout: It turns off the radio receiver when the family is away from home for an extended period of time. Wireless keypads, keychain remotes, and solenoid operated deadbolts. Some sophisticated features like fingerprint keypad, carbon monoxide sensor, and home automation systems which allow opening the garage door from office over the internet. Safety is of utmost importance for a garage door opener, especially with the children present at home. It must be provided with a quick-release mechanism on the trolley. So that the garage door gets disconnected from the door opener in case of entrapment. Visit Garage Opener portal frequently for the latest information.